In an extraordinary letter, Warren highlighted several critical shortcomings at the Wall Street oversight agency. 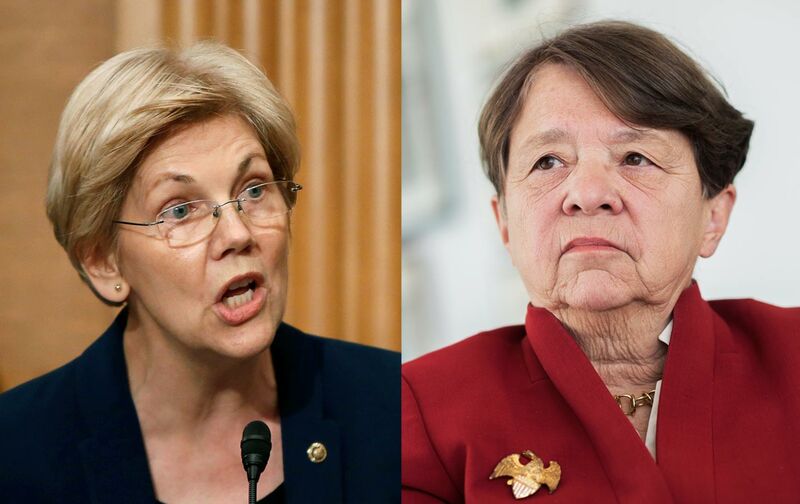 For many months, Senator Elizabeth Warren has been castigating Securities and Exchange Commission chair Mary Jo White during hearings, media appearances, and in letters to the agency. Friday morning, Warren finally asked President Obama to replace her. In a strongly worded letter to the White House, Warren outlined her principal objections to White’s tenure and what she described as “brazen conduct”: namely, White’s refusal to develop an SEC rule that would force publicly traded companies to disclose political donations, along with White’s failure to fully implement Dodd-Frank financial reforms. A bipartisan group of former SEC commissioners have asked for a political-spending rule, which would, in their view, give investors better insight into the political activity of companies in which they invest. Many good-government reformers also see the rule as a way to throw sunlight into the post–Citizens United world of campaign finance, in which corporations generally favor funneling political contributions through opaque 501(c)(4) outfits. Obama has said he favors a political spending rule, and White’s predecessor as SEC chair, Mary Schapiro, came out in support of such a rule not long before leaving her post. But White almost immediately scrapped the rule upon becoming chair herself, and it hasn’t appeared on the SEC’s regulatory agenda since. “Chair White’s refusal to move forward on a political spending disclosure rule serves the narrow interests of powerful executives who would prefer to hide their expenditures of company money to advance their own personal ideologies,” Warren wrote. Warren also blasted the slow pace of Dodd-Frank rulemaking at the SEC, and noted that the agency has failed to implement 19 mandatory rules, including critical measures on “pay versus performance” disclosure requirements, dissemination of information about security-based swaps, and a rule to increase transparency about loan securities. “Chair White…appears to view these congressional mandates as mere suggestions that the agency is free to ignore,” Warren wrote. Warren has been sharply critical of this theory, and has noted several times that many investors and investor studies dispute it. (The US Chamber of Commerce, funded by many large publicly traded corporations, does not). In congressional hearings, Warren has confronted White over her “information overload” theory, and demanded information about what studies White can point to in order to support her theory, and to disclose how much time and agency resources are being spent on anti-disclosure initiatives. According to Warren’s letter on Friday, White has not substantially answered any of her questions. There’s a fairly small chance Obama will do this, but Warren’s effort is no doubt intended to at least put more heat on White to speed along the rulemaking process and consider a political spending rule. Moreover, Warren is firing yet another warning shot to the next president about the role Warren expects to play. While Obama is unlikely to demote his own selection for chair, Hillary Clinton could plausibly do so without appearing to do an about-face. Warren has already sent signals she will not accept cabinet appointments with Wall Street backgrounds to financial oversight positions in a new administration, including some specific nominees that Clinton might appoint. Recent WikiLeaks disclosures showed Clinton aides assuming that Warren intended to play a key role in pressuring Clinton on cabinet appointments, and Friday’s letter unquestionably ratchets up that pressure.